But, in the past aliens have tried to kill the doctor to steal his regeneration power. Could this girl in the Space Suit have stolen the power to regenerate rather than being an actual time Lord. That's a point that I hadn't considered. Neil Gaiman episode, but it looks like this could be really horrible. The actress looks worse than the lady who plays River Song. I'm really looking forward to gaiman's ep. 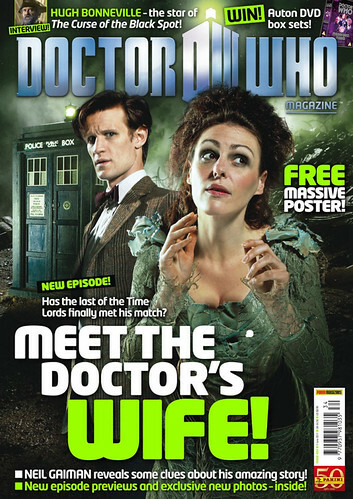 Kind of hilarious that the doctor's wife isn't River Song (if the magazine cover isn't a swerve). That was disappointing. I expected a lot more from the pirate episode. Oh well, they have a flop or two every season, guess it's good to get it out of the way early. the cast. Did it make any sense to have the Doctor break glass when any cut could have meant his doom? Did it make any sense that all that were marked *except for Rory* were immediately taken by the siren? Did the horrible CPR make a bit of sense? No. It was uneven writing at best. I bet EMT's were cringing and audiences were groaning at the obviousness of how that last problem resolved. But put all that stuff aside and it was a pretty fun romp. Oh, and eye patch lady was back- which leads you to the horrible thought that Amy is trapped inside something, and the lady behind the door may be in reality, but god I hope that's not where they're going with that. Impossible Astronaut and Day of the Moon should have been shown together. As a whole I liked them, but was initially disappointed with the cluster mess that was the Impossible Astronaut, however- it totally paid off in Day of the Moon. Those two episodes are inseparable, and I don't think they work as stand alones. Of course, many of the original episodes were that way too. That last ending was fantastic! No clue who that girl is, but the season is off to a great start. Bring on the Pirates! I love Ace, but I'm not sure how it could be her. An interesting theory that makes a lot of sense is a split universe where Amy is simultaneously pregnant and not pregnant. Which explains the readings the doctor saw at the end of the episode. I'd like to put my Time Lord into Amy Pond's tardis and make her scream "exterminate" at the top of her lungs. Okay, the Doctor's Wife was far better that I thought it would be. I think it was the title and the crap picture on Doctor Who Magazine that had me scared. This show should not have been called "Doctor's Wife," especially when much of the season revolves around River Song and this episode didn't deal with that at all. Perhaps, the "Doctor's True Love," would have been a better title. It would have been more apropos. I won't give big spoilers until I'm sure everyone's seen the episode, but I thought it was pretty good. Sure, Amy and Rory were pretty useless, and there were many many silly things that amounted to mere stage dressing while the main story touched on some very significant points in Doctor Who history. It was definitey great seeing more of the Tardis, and to get a chance to revisit the 9 & 10 era Doctors' "controll room." And bunk beds!? Freaking Hilarious! There is some speculation that one of the voices heard in the episode is that of Paul McGann, Doctor 8, but I don't think so. I want to see McGann as much as anyone, but I don't think there was any reference to him in this episode. Overall, Gaiman did a great job with the script. It was one of the most visually interesting episodes I've ever seen in Doctor Who. It had humor, wit, and even a few creepy moments, but more than that it was a truly touching episode with a ton of heart. I rarely rewatch episodes right away, but this is one that I can't wait to see again. Who wants Fish and Chips? Quite so, quite so. The next episode has already gotten some positive buzz as well.